In the first part of this study, of the early banknotes of Bangladesh, three series of banknotes introduced in twenty-one months – between March 1972 and December 1973 – were discussed (see IBNS Journal Volume 51 Number 1). This rapid introduction of three series was, at the very least, unusual. However, it was only two-and-a-half years later, in 1976, the fourth series of banknotes was introduced. Post-independent Bangladesh became unstable for many reasons – the economy was weak, post-independence policies were argued, criticism of Sheikh Mujib within and from outside the country increased, and general discontent festered. On 15 August 1975 Sheik Mujibur Rahman was assassinated by a group of junior army officers. Not only was Sheikh Mujib assassinated, but most of his family was killed, along with his personal staff who attended him at the Presidential Palace where the assassination took place. Struggles for power after the assassination were inconclusive until Ziaur Rahman took control in November 1975. In the new political climate, bank notes bearing the portrait of Sheikh Mujib were destined to be withdrawn and it was simply a matter of time before this occurred. During 1976 a completely new series of notes was introduced, with the exception of the 1-taka note, which was released as the second variety of the third issue during 1976. The notes of this issue are notable for the absence of the portrait of Sheikh Mujib, whose portrait had dominated all issues of the Bangladesh Bank until this issue. Instead of the familiar portrait, each note has an illustration of the Star Mosque on its front (Figure 15). This issue also sees the introduction of a new colour scheme for all bank notes, and a new signatory: Mr. A. K. Naziruddin Ahmed. The first denominations to be issued were the 50- and 100-taka notes, which were released on 1 March 1976. The 50-taka note (Figure 16), as well as having the Star Mosque to the right, has a patterned area to the left which holds the watermark and a folk motif of two birds in the centre of the note. Predominantly orange, there are in fact two shades of orange used in the intaglio printing on the front of the note: the border and text are dark orange while the mosque is a lighter orange. There is also a pale orange and purple under-print with the motif of birds being purple, yellow and khaki. The style of serial number found in the previous issue is again used on this issue – consisting of a fractional prefix of a letter over a number, followed by a six-digit number. A solid security thread runs through the note to the right of centre. The back of the 50-taka note carries a scene of women harvesting tea in a tea garden; printed in orange intaglio ink and orange and blue lithographic inks. The back contains the name of the Bank and the denomination of the note in English (with no Bengali text being used). Also included on the back of the note is the emblem of the Bangladesh Bank and a clear area for viewing the watermark. The watermark remains unchanged from the previous issues. The 100-taka note (Figure 17) has one distinct difference to all other notes in this issue, this being the positioning of the illustration of the Star Mosque and the watermark. On all other denominations in this series, the vignette of the Star Mosque appears on the right-hand side of the notes, with the watermark to the left; but on the 100-taka note the Star Mosque appears on the left-hand side and the watermark on the right. A multicoloured note, it uses blue intaglio printing for the mosque, text and borders of the note, while brown, green, pink, blue and orange are used for the lithographic under-print. The back of the 100-taka note carries a riverine scene so typical of Bangladesh. The scene is predominantly blue, but also contains khaki and green, with all printing done by lithography. The 10-taka note (Figure 19) is also very similar to the note it replaced, with the same three elements of the note changing which also changed on the 5-taka note: the colour, the illustration on the front, and the signature. The colour is now burgundy with green highlights; the Star Mosque replaces the portrait of Sheikh Mujib; and Naziruddin Ahmed signs the note. The back of the new note is the same as the note it replaced, differing only in the colours used, with the new note using burgundy and blue. The final note of the fourth series was the new denomination of 500 taka (Figure 20), which was released into circulation on 15 December 1976. Printed by the German security printers Giesecke and Devrient, this new denomination note is multicoloured, although most colours tend towards the blue end of the colour spectrum. For the first time on a Bangladeshi note, the intaglio printing on the front of the note is done with three colours: blue, purple and black. The lithographic under-print is blue, purple and orange. To the right of the note is the Star Mosque in a decorative oval, while to the left is a pale area with a pattern of vertical lines that holds the watermark, below which are illustrated several Shapla flowers. In the centre of the 500-taka note is the promissory clause which is couched in the ‘Second Form’. Underlying the text of the promissory clause is a sickle and harvested rice held by a raised hand, while a cog is depicted to the left. The illustrations of the sickle and the cog represent the socialist background of Bangladesh, with the sickle and rice representing agricultural workers and the cog representing industrial workers. The back of the note has an illustration of the Supreme Court Building in Dhaka (Figure 21), while to the left is the emblem of the Bangladesh Bank and to the right a white area reserved for viewing the watermark. Below the watermark is a design of Shapla flowers floating on water, and this design registers perfectly with the similar design on the front of the note when held to the light – this being the first use of ‘perfect registration’ on a Bangladeshi bank note. As well as the introduction of the new security feature of perfect registration, the 500-taka note introduces two changes to the standard security features used in the Bangladeshi bank notes. The first change appears in the use of watermarks. For the first time there are two watermarks used on a note and this distinction was continued for a number of issues of the 500-taka note. The head of a Bengal tiger continues to be used in the area typically reserved for the watermark, although the Bengal tiger is now depicted in a restful pose, with its head lying on its folded front paws. This new watermark is referred to as Type 2. The additional watermark carried by the 500-taka note appears in the centre of the note in the form of ‘৫০০’, which is the Bengali text for the denomination of the note. This watermark is referred to as Type 3. The second change, introduced with this note, is in the use of the security thread. Until the issue of this note, all security threads in the Bangladeshi notes were solid security threads, but for the first time a micro-printed security thread is used. The micro-printing on the thread reads ‘Bangladesh Bank’ in Bengali characters (Figure 22). The five notes issued in the fourth series have two different formats for the serial numbers. The 5-, 10- and 50-taka notes all have a fractional serial number prefix of a letter over a number containing one or two digits, followed by a six digit number. However, the 100-taka note has a single letter prefix followed by a seven digit number and the 500-taka note has a single letter prefix followed by a six digit number. For all serial numbers, Bengali letters and numerals are used. Only one specimen note has been seen for this issue, although they are expected to exist for all denominations. The specimen note for the 500-taka note is interesting, in that it appears on two separate pieces of paper. The design for the front and the back of the note appear on the front of the individual pieces, with the word SPECIMEN printed in red with a serif font, sloping from the bottom left to the top right. The serial numbers for the front of the note are ‘ক ০০০০০০’. Written in various sized fonts, both vertically and horizontally on the back of each piece of paper is the word ‘WERTLOS’ (which means ‘no value’ in German), and the name of the printer: ‘Giesecke & Devrient’. It is likely specimen notes were also prepared for this denomination in the usual form of a single note. First issued 11 October, 1976. Size 120 mm x 65 mm. Serial Number Fractional prefix and six numerals; in Bengali characters. Signature A. K. Naziruddin Ahmed. Colour Front: Predominantly brown, with an under-print of orange, purple, green and pink. Back: Brown with a slight under-print of green; with green highlights to the left. Size 140 mm x 70 mm. Colour Front: Purple intaglio printing with an under-print of blue, pink, purple, green and brown. Back: Predominantly purple with shades of blue. First issued 1 March, 1976. Size 153 mm x 70 mm. Colour Front: Orange intaglio printing with an under-print of green, blue, pink and orange. Back: Orange intaglio printing with an under-print of blue and green. Size 163 mm x 70 mm. Serial Number Single letter prefix and seven numerals; in Bengali characters. Back: Blue intaglio printing over an under-print of green, blue and yellow. First issued 15 December, 1976. Size 170 mm x 70 mm. Watermark Resting tiger and ‘৫০০’. Security thread Micro-printed with Bengali text (Figure 22). Serial Number Single letter prefix and six numerals; in Bengali characters. Colour Front: Blue, purple and black intaglio printing overlay an under-print of blue, orange and brown. Back: Black, blue, brown and orange. The fifth issue of bank notes was introduced over a two-year period from December 1977 to September 1979. The notes of this issue are very similar to those of the fourth issue; except the ‘Star Mosque’ has been replaced on most notes by a new vignette and the colours of the notes are a little darker. There is also a change in signatory, with the new Governor of the Bangladesh Bank being Mr. M. Nurul Islam. However, Nurul Islam’s signature appears in two varieties, suggesting the notes in this series were not all prepared by the same printer, with each printer receiving a different specimen signature. The first note of this series to be introduced was the 100-taka note (Figure 23), which was placed into circulation on 15 December 1977. This is the only note in this issue to maintain the Star Mosque on the front of the note. (The 500-taka note, which continued to carry an illustration of the Star Mosque in future series, was not issued in this series). The vignette is enclosed in an oval on the right-hand side of the note, while the watermark appears at the left in an area covered by a pale blue pattern. The 100-taka note adopts the innovation, introduced in the 500-taka note of the fourth series, of using three colours for the intaglio printing on the front of the note – these colours being blue, brown and orange. Included in the multicoloured under-print on the front of the note, which is coloured blue, green, pink and brown, is a traditional folk motif. The back of the note carries a picture of the unfinished southern gate of Lalbag Fort in Dhaka (Figure 24), and is coloured with light blue, dark blue, light brown and dark brown inks printed by lithography. The use of a number of bright and contrasting colours makes this note the most attractive piece in this issue. The second note of the fifth issue to be introduced was the 5-taka note (Figure 25), which made its appearance on 2 May 1978. Alike in virtually all respects to its predecessor in the fourth series, the only differences are the new illustration on the front of the note, the signature and the slightly darker colours. The illustration replacing the Star Mosque is a ‘Mihrab’, or prayer niche, of the Kusumba Mosque (Figure 26). The back of the note remains unchanged from the 5-taka note of the fourth series. The 10-taka note (Figure 27) was introduced on 3 August 1978. It also is identical to its predecessor except for the slight change in colour, the signature and the new illustration on the front. The illustration replacing the Star Mosque on this note is the Atiya Jami Mosque. The back of the note is the same as the note it replaced, with the exception of a slight change in colour. There was no 500-taka note released in this issue, but a new denomination note of 20 taka (Figure 30) was introduced on 20 August 1979, being the last note of this issue prepared by the Bangladesh Bank. This new note is predominantly green, with dark green intaglio ink used for the text of the note, the border, and the vignette of the Chota Sona Mosque. The under-print is green, yellow and purple, with a green, orange, brown and purple folk motif in the centre of the note depicting a flowerpot. The watermark is to the left and is covered by a pattern imitating the flowerpot motif. The serial numbers on the 20-taka note are the same as that used for the 50-taka note, being one letter followed by a seven-digit number, all in Bengali characters. The back of the 20-taka note is green with shades of pink and yellow, and carries an illustration of four men washing jute in a river beside a field of paddy rice. The name of the Bank and the denomination are written only in English on the back of the note. The one dramatic variation in this new note is the security thread. 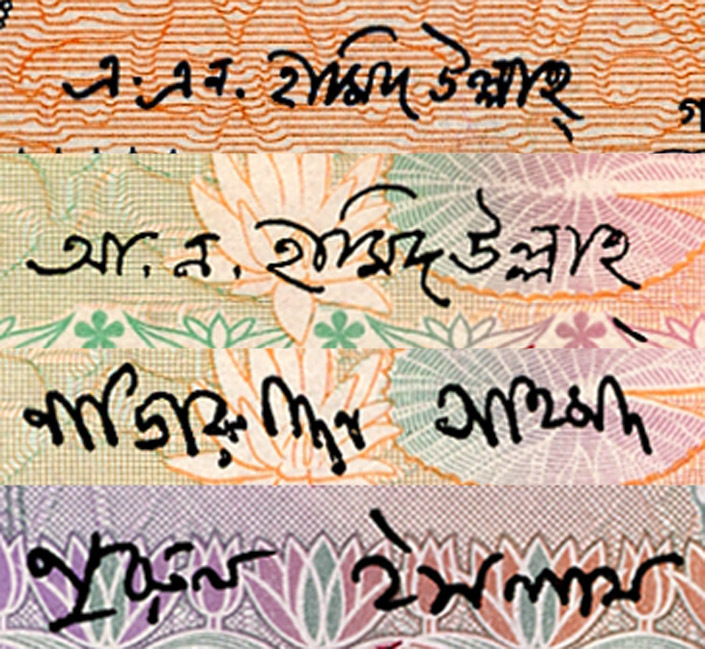 Until the issue of this note all security threads were solid, with the exception of the 500-taka note, which had introduced a micro-printed thread with Bengali text. The 20-taka note carries a micro-printed thread (Figure 31), with the words ‘Bangladesh Bank’ printed in English, and this is the only note in the entire issues of Bangladesh to carry this type of thread. The final note in this series is not one issued by the Bangladesh Bank, but one issued by the Government – this being a new 1-taka note (Figure 32). Released into circulation on 3 September 1979, this note is one of the most beautiful of all the Bangladeshi issues. Predominantly orange and purple, the note is printed entirely by lithography. Dominating the front of the note, and slightly to the right, is the national emblem of Bangladesh, enclosed by an ornamental guilloche. 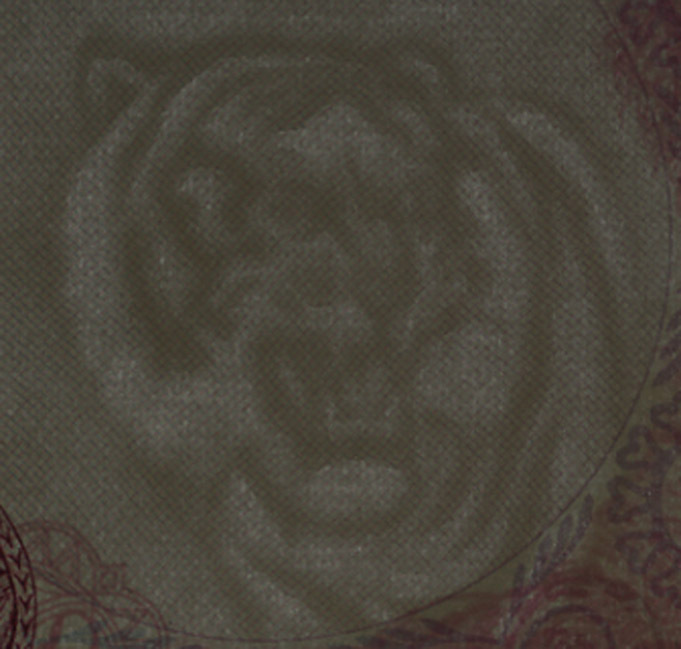 To the left is a pale shaded area that holds a watermark of the Royal Bengal tiger, with the watermark being the same as that used on the 500-taka note of the previous issue, i.e. the Type 2 watermark of a resting tiger. While the text on the front of the note is standard, the text for ‘One Taka’ is creatively written vertically along the right-hand margin. The note is signed by Abdul Khair, the new Finance Secretary. The back of the 1-taka note has the same colour scheme as that of the front, and carries an illustration of three spotted deer. All the text on the 1-taka note is once again written entirely in Bengali. The security thread for this note runs through the far right-hand side of the note (when viewed from the front) and, for the first time on the 1-taka notes, use is made of ‘perfect registration’. 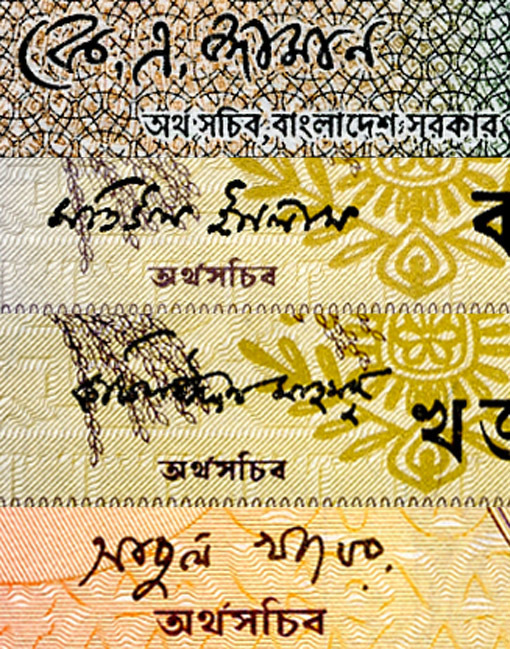 This occurs where a small white diamond in the pattern on the back of the note (to the right of the deer) registers perfectly with the same shape on the front of the note, which appears directly below the Bengali text that runs across the top of the note. Only one specimen note has been seen for this issue, although specimen notes are expected to exist for all denominations. The 10-taka note (No. 21) has the word SPECIMEN printed in a red serif font on the front and back, a single hole punched through the signature of Nurul Islam, and a serial number of ‘ক/১ ০০০০০০’. First issued 3 September, 1979. Front The State Emblem of Bangladesh. Size 100 mm x 60 mm. Serial Number i Single letter prefix and seven numerals; in Bengali characters. ii Double letter prefix and seven numerals; in Bengali characters. Colour Front: Orange, yellow and purple, with brown text. Back: Orange, yellow and purple. First issued 2 May, 1978. Front Mihrab of the Kusumba Mosque (Figure 26). Back: Brown with an under-print of green; with green highlights to the left. First issued 3 August, 1978. First issued 20 August, 1979. Size 147 mm x 70 mm. Security thread Micro-printed in English (Figure 31). Colour Front: Green intaglio printing with an under-print of purple, orange and brown. Back: Green with a feint pink and green under-print. First issued 4 June, 1979. Front Sat Gambuj Mosque (Figure 29). Colour Front: Orange intaglio printing with an under-print of light and dark green, purple, and blue. Back: Orange intaglio printing with an under-print of blue and orange. First issued 15 December, 1977. Front Star Mosque (Figure 15). Back Southern gate of Lalbag Fort (Figure 24). Colour Front: Blue, brown and orange intaglio printing, with an under-print of blue, green, purple and khaki. Back: Brown, dark blue and light blue. The symbol used to represent the ‘Taka’ is the symbol above. This is used in much the same way as the symbols ‘$’ and ‘£’ are used to represent ‘dollars’ and ‘pounds’. In keeping with the General usage and expression of the common people of Bangladesh ‘currency’ and ‘coins’ of the country have been named as ‘Taka’ and ‘Poisha’ respectively. Legal sanctions have been given to these nomenclatures under the Bangladesh Coinage Order, 1972 (P. O. No 83 of 1972). Under provision of the Bangladesh Coinage Order, the government has decided that ‘৳’ shall be the symbol of Bangladesh currency and coins with immediate effect. This symbol resembles more or less [the] Bangla letter ‘T’ and have [sic] close affinity with the sound and expression of money in the country. This can be easily recognized, identified and adopted by common people. This is a unique feature of Bangladesh currency and it reflects tradition, usage and aspirations of the people of Bangladesh. For the convenience of typing and international dealings, [the] abbreviation ‘Tk’ has also been prescribed by the Government where the above symbol ‘৳’ is not available in type or in prints. The Bengali character ‘ট’, on which the symbol for the taka is based, is the letter that is equivalent to ‘T’. It is the first letter of the word ‘Taka’ (টাকা). The first watermark to be used on the bank notes of Bangladesh is the head of a snarling Bengal tiger. This watermark initially appeared in the second issue of bank notes and continued to be used in the third, fourth and fifth issues. All notes of the second series issued by the Bangladesh Bank carry the watermark on the right-hand side of the note, while subsequent issues carry the watermark on the left-hand side of the notes. The second and third 1-taka notes issued by the Government also carry the watermark of the snarling tiger. 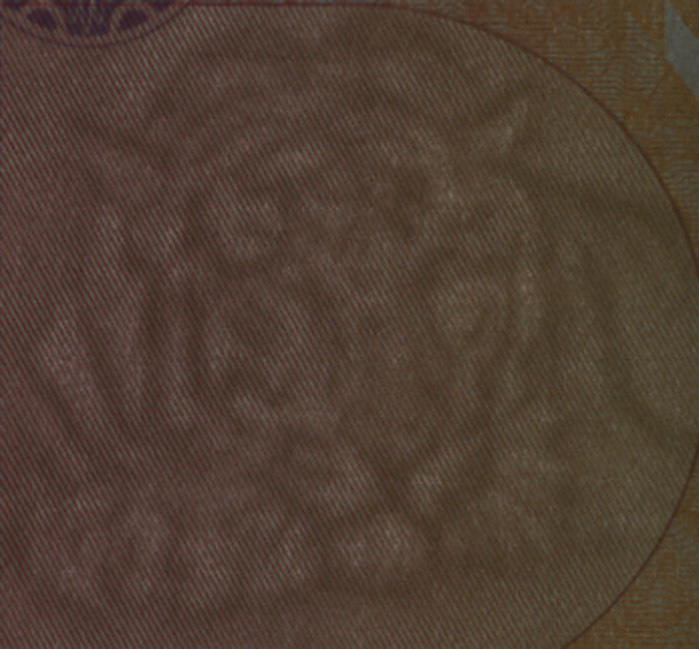 While the second 1-taka note has the tiger facing to the left, the third 1-taka note has the tiger facing to the right, in the same manner as the notes issued by the Bangladesh Bank. The second watermark is another depiction of a head of a Bengal tiger, but this depiction is a peaceful image, with the tiger resting its head on its front paws. The 500-taka note introduced in 1976 was the first note to carry the new watermark, but it was also used for the 1-taka note introduced in 1979—although it was reduced in size for the smaller note. These two notes are the only notes to carry this watermark. The third watermark is specific to the 500-taka note and consists of the number ‘500’ written in Bengali numerals, i.e. ‘৫০০’. The watermark appears in the centre of the 500-taka notes, set slightly towards the bottom. This watermark was initially used in the first 500-taka note introduced in 1976. The Finance Secretary signs the 1-taka notes issued by the Government of Bangladesh and the Governor of the Bangladesh Bank signs the notes issued by the Bank. For the notes discussed in this study, there are four Finance Secretaries who signed the notes and three Governors, although A.N. Hamidullah used two signatures. Nota bene: There are two styles of the signature of M. Nurul Islam used on the bank notes, with the signatures on the 50- and 100-taka notes of the fifth issue being noticeably smaller. It is most improbable many countries produced quite as many bank notes in a decade – indeed a period of seven years from 4 March 1972 to 3 September 1979 – as did Bangladesh. Many of the reasons for the various issues are identified above, but it will greatly assist the collector to read the history of Bangladesh. No particular sources are recommended, but a good encyclopaedia will give a grounding in the history of the nation – identifying the circumstances leading to the civil war, the rise of Sheikh Mujibur Rahman and the Awami League, the tragedy of the civil war, the decline and assassination of Sheikh Mujibur Rahman, and the troubled economic times which dogged the nation in its nascent years. It is indeed an interesting story. The sources for this study are predominantly contemporary newspaper articles and the Annual Reports of the Bangladesh Bank. This study was largely completed in 2001 and has remained incomplete for some time. I had hoped to determine many things I did not know but, in the end, there are still facts to be determined, particularly with regard to printers of the bank notes, and hopefully this information will become known in time. The following sources were used for this study. Ashan, Syed Ali [Editor] Bangladesh – A souvenir on the first anniversary of Victory Day December 16, 1972 Dhaka; Ministry of Information and Broadcasting, Government of the People’s Republic of Bangladesh, 1973. Bangladesh Bank Annual Report, Dhaka; 1973 through 1996-97. Bruce, Colin R. and George S. Čuhaj 1998 Standard Catalog of World Paper Money – Sixth Edition – Volume Three – Modern Issues 1961–2000 Iola, USA; Krause Publications Inc., 2000. Constituent Assembly of Bangladesh Constitution of the People’s Republic of Bangladesh (Authorised English Translation) Dhaka, 1972. Hasan, Syed Mahmudul A Guide to Ancient Monuments of East Pakistan Dacca; Society for Pakistan Studies, 1970. Huq, Enamul [Editor] Meet Bangladesh Dhaka; Department of Films and Publications, Government of Bangladesh, 1979. Islam, Mohammed Jahirul Paper Money of Bangladesh, Dhaka, Bangladesh; Bangladesh Institute of Philatelic Studies, 2003. Michell, George [Editor] The Islamic heritage of Bengal Paris; UNESCO, 1984. Murray, Jon Bangladesh – a travel survival kit (Second Edition) Hawthorn, Australia; Lonely Planet Publications, 1991. Newton, Alex, Betsy Wagenhauser and Jon Murray Bangladesh – a travel survival kit (Third Edition) Hawthorn, Australia; Lonely Planet Publications, 1996. Radice, William Bengali (Teach Yourself Series) London; Hodder & Stoughton, 1994. Wright, R. E. Let’s Visit Bangladesh Houndsmill, Basingstoke, U.K.; Macmillan Publishers Ltd.